The ancestors of the Greater Swiss Mountain dogs are the strong tricolour dogs, sometimes also black and tan or yellow only, widespread in all Europe, which we refer to as Villon (1491) under the name of “mastiffs or dogs of butchers”. They were employed to guard and protect goods and cattle, as shepherd dogs or sled dogs by butchers, cattle traders, horse traders, artisans and farmers. In 1908, at Langenthal, on the occasion of the jubilee show to mark 25 years of existence of the “Schweizerische Kynologische Gesellschaft” (Swiss Cynological Club) SKG, two short-haired Bernese Mountain Dogs were presented to the great promotor of the Swiss Mountain Dogs, Professor Albert Heim. He recognized them to be representatives of the old, vanishing, large Mountain Dogs or butcher’s dogs. 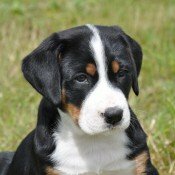 In 1909 they were recognized by the SKG as a separate breed being registered in volume 12 of the Swiss Stud Book under the name of “Greater Swiss Mountain Dog”. Then, in the Bern canton, other dogs were found to match perfectly with the description given by Albert Heim, and they were incorporated into the systematic pure breeding programme that had been established. 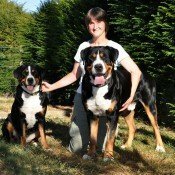 In 1912, the club for “Grosse Schweizer Sennenhunde” (Greater Swiss Mountain Dog Swiss Club) was founded in order to promote this breed and keep it purebred. For many years, the breeding base remained reduced, mainly due to the difficulties to find the appropriate female dogs. It was not until 1933 when more than 50 dogs a year started to be registered in LOS. The first standard was published by the FCI not before February 5th, 1939. The distinguished services performed by the Great Swiss Mountain Dogs in the army during World War II, both as sled and saddle dogs attracted people’s attention to the breed’s moderate temperament and trustworthiness; their prestige favoured their spread and, in 1945, for the first time, more than 100 Greater Swiss Mountain puppies were registered in the LOS, whose numbers increased from 350 to 450 dogs. 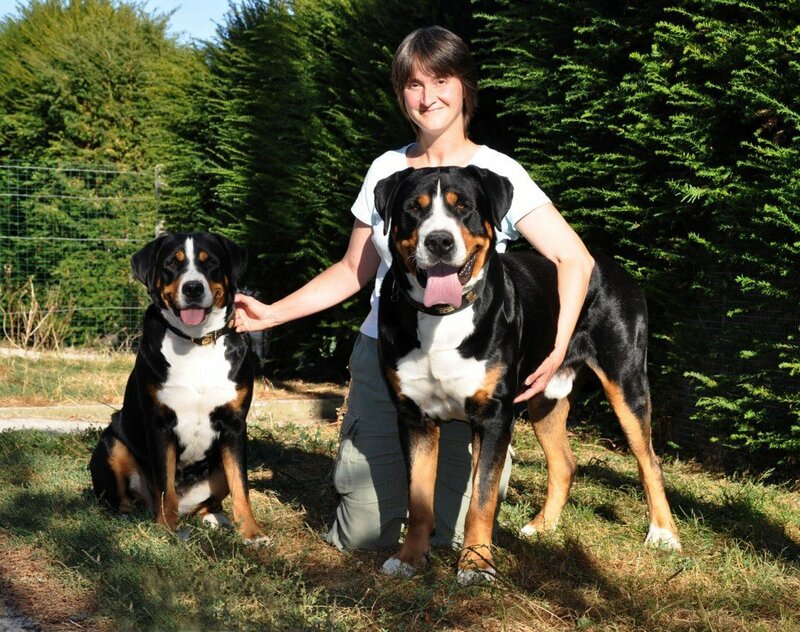 Today these dogs are also bred in other European countries around Switzerland, where they are especially appreciated as family dogs due to their calm, reliable temperament. The growth of the Greater Swiss Mountain Dogs is fast. As you already know, they are large breed dogs. During the first months it is recommended not to make them jump, and avoid slippery floors and stairs. 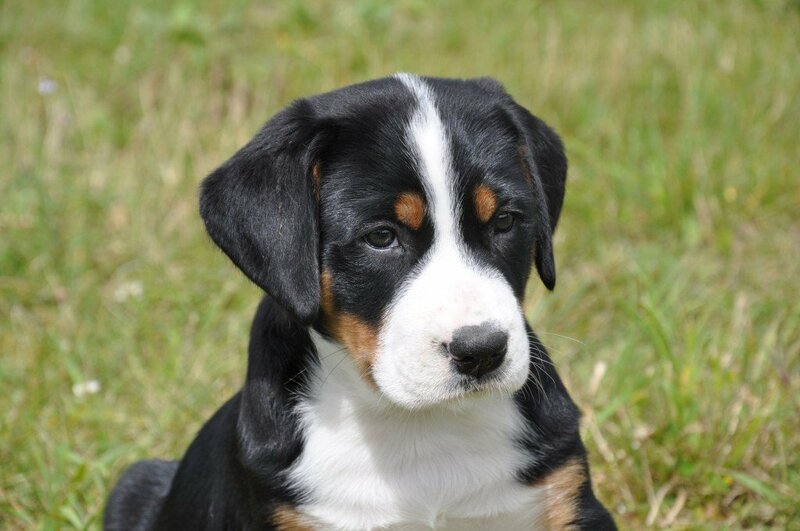 In fact, the Greater Swiss Mountain puppies are clumsy. We must also watch the games with other dogs, in order to prevent them from being too brutal. Their cartilages are fragile during the growth stage. And paying attention to it is an owner’s responsibility, since they will do anything to have fun. Prevention is better than cure. Their education is simple. They are sensitive dogs and they will do everything with your complicity. Of course, you also need to know how to be firm, because sometimes it will be necessary. It is preferable for them to eat twice a day (morning and evening). And obviously, prevent them to run after the bowl, to avoid a possible stomach inflection. Besides their maintenance care, it is necessary to remember about worming them once a month until they are 6 months and then twice a year once they are adults, as well as the treatment against ticks during summertime. (Grosser Schweizer Sennenhund)TRANSLATION: Mrs. C.Seidler, revised by Elke Peper. Mountain- and Cattle Dogs. Section 3 Swiss Mountain- and Cattle Dogs. GENERAL APPEARANCE: A tricolour, sturdy, heavy boned and well-muscled dog. In spite of his size and weight, he presents endurance and agility. The difference between the sexes is distinctly obvious. •Body length (measured from the point of the shoulder to the point of the buttock) to height at withers = 10 : 9. •Depth of chest to height at withers = 1 : 2. •Length of skull to length of muzzle = 1 : 1. •Width of skull to width of muzzle = 2 : 1. BEHAVIOUR / TEMPERAMENT: Self-confident, alert, watchful and fearless in everyday situations. Good-natured and devoted towards people familiar to him. Self-assured with strangers. Medium temperament. HEAD: Strong corresponding to the body, but not heavy. Male dogs stronger head than female dogs. CRANIAL REGION: Skull: Flat and broad. The frontal furrow beginning at the stop gradually runs out towards the top. General appearance: Straight and parallel when seen from the front, set rather broad. Shoulders: Shoulder blade long, strong, well laid back, close-fitting to the body and well-muscled, forming a not too obtuse angle with the upper arm. General appearance: Straight and not too close when seen from the back. Metatarsus and feet turning neither in nor out. Dewclaws must be removed except in countries where their removal is forbidden by law. Upper thigh: Fairly long, broad, strong and well-muscled. COLOUR: Typically tricolour. Main colour black with symmetrical, reddish-brown (tan) markings and clean white markings. The reddish-brown colour is situated between the black and the white markings on the cheeks, above the eyes, on the inside of the ears, on both sides of the forechest, on all four legs and underneath the tail. The white markings are on the head (blaze and muzzle), running down unbroken from the throat to the chest, also on the feet and the tip of the tail. Between the blaze and the reddish-brown markings above the eyes, a band of black should remain. A white patch on the neck or a white collar around the neck are tolerated. Height at withers for male dogs: 65 – 72 cm, height at withers for female dogs: 60 – 68 cm. •Absence of any teeth other than 2 PM1 and /or PM2 (Premolar 1 or 2). The M3 are not taken into account. Level bite. •Light eyes. Lids not close fitting. •Coat: Visible yellow-brownish or light grey undercoat. •Over- or undershot mouth, wry mouth. •One or two blue eyes. •Main colour other than black.